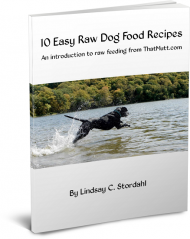 Note: This post has been expanded into an ebook with 10 easy raw dog food recipes and a guide to raw feeding. Click the button below to download the ebook. I always wanted to switch my dog to a natural, raw diet. I held back because I needed to do some research on canine nutrition and the pros and cons of a raw diet for dogs. Feeding raw doesn’t have to be complicated, but it’s not as easy as tossing a cup of kibble in a bowl. To see if a raw diet is right for my dog Ace, I did a lot of research. Next, I decided to feed him a pre-prepared, commercial raw diet for 90 days to see if the diet works for us. He ate raw dog food that came in ground, frozen patties including meat, organs, bones, fruits and veggies. Through this post and my ebook, I hope I encourage you to think about switching your dog to a raw diet, or at least a natural, grain-free kibble. A raw diet for dogs is simply that – raw. Raw meat, raw organs and raw bones along with raw fruits and raw vegetables if you so choose. Why is a raw dog food diet healthy for my dog? Raw, organic dog food is the healthiest food for my dog because it is fresh, whole and unprocessed. Dogs can get by on a heavily processed diet (just like their owners get by), but it’s not the healthiest. A wide variety of fresh, unprocessed foods contribute greatly to a dog’s overall health. Why can’t I cook the meat for my dog? I can, but why would I? Remember, dogs ate raw meat for thousands of years before “dog food” was invented. 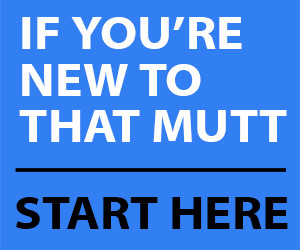 To learn more about feeding your dog a homemade raw diet, download my ebook for $9 using the button below. Why is dry dog food kibble bad for my dog? I do not have to be a vet or a nutritionist to realize that most commercial dog foods are not ideal for Ace. Please read the ingredients of your dog’s food and let me know what you find out. The first two ingredients in a dog’s food should be high-quality proteins, according to Michelle Smith, owner of Natural Pet Center in Fargo, which sells natural dog food and other pet products. These should be specific proteins like duck or chicken. Other ingredients should be high-quality fruits and vegetables. Grain is not necessary, and all corn and by-products should be avoided. When an animal goes to a slaughterhouse, only about half of that animal is used in human foods, according to Born Free USA, a national animal advocacy organization. These “other parts” (heads, feet, blood, unborn babies, etc.) are considered by-products and are used in pet foods. “Meat meal,” “poultry meal” and “by-product meal” are also common ingredients in pet foods, according to Born Free. The term “meal” means the ingredients have been rendered. Rendering plants take all the random, leftover body parts and boil them down to a broth. Although the high temperatures kill bacteria and parasites, the natural enzymes and proteins found in raw ingredients are also destroyed. An animal that died on the farm may not reach the rendering plant for several days, according to Born Free. By this time the carcass is highly contaminated. Although so called “4D” animals (dead, dying, diseased or disabled) are now banned as ingredients in human food, they are legitimate ingredients for pet food. Many pet foods also contain brewers rice as the first or second ingredient, which is an inexpensive rice by-product that contains no nutritional value, according to the Association of American Feed Control Officials. The AAFCO sets (unenforced) standards for the quality of livestock feed and pet food. If you do decide to feed your dog rice (most dogs don’t need grain in their diets), make sure it’s whole grain brown rice. Commercial dry dog food is also loaded with chemical preservatives, sweeteners and dyes, according to Born Free. None of these ingredients provide any nutritional value to a dog. They are used to improve the taste and appearance of the food. Potentially cancer causing chemicals such as BHA, BHT and ethoxyquin are permitted in pet foods as preservatives. 1. A raw diet is the healthiest diet for most dogs. A raw diet is the healthiest diet only if it is done properly. Do your research or you could end up with a very sick dog. A raw diet is the healthiest diet for dogs because it consists of real, raw meat without any preservatives or by-products. Raw food also contains natural enzymes that haven’t been destroyed by the cooking process. 2. A raw could potentially help to prevent cancer and many other health problems. While a raw diet is not a “cure” for most health problems, it can definitely help improve your dog’s overall health. A raw diet can help prevent obesity, allergies, diabetes, cancer, heart disease and so much more. Don’t wait until your dog has something terrible like a cancer diagnosis before you switch him to a healthier diet. Switch his diet now in order to potentially prevent future diseases. 3. Dog food companies do not necessarily care about the health of your dog. Dog food companies want to make money. That’s why most dry dog food is made with cheap ingredients like corn, rice by-products and animal by-products. You can’t trust a bag of kibble to provide your dog with the nutrition he needs just like you can’t trust a TV dinner to give you the nutrients you need. It’s fine every now and then, but a lifetime of eating this way creates serious problems. 4. When you make homemade raw dog food, you know exactly what she is eating. 5. A natural raw diet makes it easy to add more variety to your dog’s food. If I ate the same food for every meal, I would start to become deficient in certain vitamins or minerals. However, when I look at my food overall, I am eating the nutrients my body needs throughout each day or week. This is why you want to mix up your dog’s food. Once your dog adjusts to one raw protein such as chicken, you can start switching it up and feeding him turkey, duck, salmon, beef, lamb, etc. Plus, you can add all kinds of yummy vegetables to the food such as broccoli or carrots. 6. Your dog will look healthier if she eats natural raw dog food. 7. Raw dog food contains enzymes that are important to the body. These enzymes are important for digestion and nutrient absorption. When food is heated above 118 degrees Fahrenheit, the enzymes are destroyed, according to Aimee Quemuel in her book “42 Rules to Fight Dog Cancer.” For the same reason, you should include raw fruits, vegetables and nuts in your own diet. 8. You love your dog and you want him to receive the very best care. The least you could do for him is look into a raw diet and see if it’s something reasonable for you and your dog. No one loves your dog more than you. And no one is looking out for his health better than you. Don’t forget that. 9. Dogs ate raw food for thousands of years. 1. Feeding a dog a raw organic diet costs more. Some hard-core raw food enthusiasts will tell you that feeding your dog raw does not cost any more than a high-quality kibble. This might be true if you’re going to buy mass quantities of meat in bulk or if you work out a deal with a local rancher. But who’s really going to do any of that? Not me. If I feed my dog a raw diet, I just assume I’m going to pay quite a bit more. During this trial, Ace will be eating pre-prepared raw patties. If I make the food myself, I will be buying meat from the grocery store. Either way, $$$$. 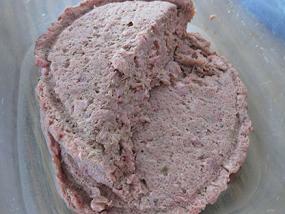 Here are some tips on making raw dog food affordable. 2. Feeding a dog a natural raw diet can give the dog an upset stomach. There are mixed thoughts on this. Sure, raw meat can make a dog sick, but so can cooked food. A new diet is bound to cause a few digestive issues. Some raw dog food companies and vets say it’s better to switch the dog from kibble to raw instantly, with no transition. The reason for this is because it’s difficult to digest the combo of kibble and raw. Others say to do a gradual switch the way you would with two kibbles. This is the route I am taking. Either way, if my dog experiences an upset stomach, it will pass. 3. Raw dog foods are messy. 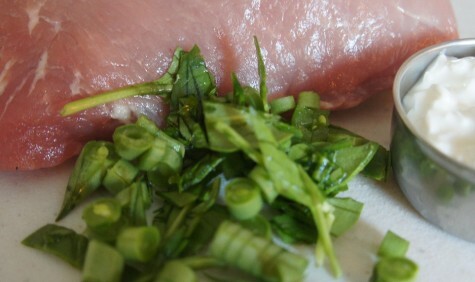 Cleaning up after a sick dog is messy, but so is preparing a bunch of raw meat. It’s smelly, and it sits in your fridge to de-frost. The dog’s bowls and eating area will probably also be messier. And in Ace’s case, there will be more drool, too. You’ll also have to wash your own hands, the dog’s bowls and the area where you prepared the food because of the raw meat and the possibility of bacteria. It’s no different than the precautions you take to prepare your own meat. 4. Feeding a raw dog food diet is time consuming. If you go with the pre-prepared route like I’m doing, it doesn’t take that much time. You just throw a patty in a dish and let it de-thaw overnight. Then serve. But you will have to wash your dog’s bowls more often. And, if you plan to prepare all the food yourself using your own ingredients, then you’ll spend time planning the meals, shopping for ingredients, storing the ingredients, preparing the food and cleaning up. 5. Storing raw food for your dog takes up more space. We have a small freezer. Right now my freezer is holding two weeks of raw food for Ace, along with some of my own food. If you have a small dog, storage won’t be as much of an issue. But if you have medium to large dog (or a great dane!) or if you have multiple dogs, you should consider buying a larger freezer for more storage. 6. Some dogs can’t handle all the raw protein. Old dogs, dogs with kidney issues and dogs with pancreatitis (inflammation of the pancreas) are just a few examples of dogs that should not eat a raw diet, according to Anderson. Always check with your vet if you are not sure. 7. Your vet might not understand the benefits of a raw diet for dogs. A good vet will listen to you and openly discuss the pros and cons of a raw diet for your dog. If your dog’s vet does not support a raw diet, find a holistic vet in your area or explain to your current vet why you are interested in a raw diet. Anderson said she typically does not recommend a raw diet for her clients’ dogs because it is too complicated to maintain longterm. It’s also hard to know whether or not your dog is getting a balanced diet, especially if you are making the food yourself. 8. 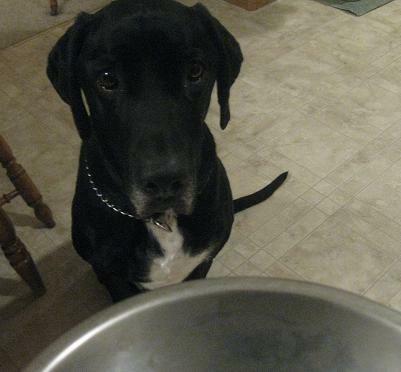 Your dog will be begging for more ‘human’ food. This will be a nonissue for most of us since most of our dogs already beg. Lately I’ve been more likely to mix in healthy table scraps, vegetables or cooked meat with Ace’s food or give it to him as treats. Now he seems to expect a piece of banana when I make my morning smoothie. He seems to expect a piece of asparagus when I am cooking vegetables, etc. When he gets too annoying with his begging, I make him lie on his bed in the other room. Poor Ace. 9. It’s difficult to feed your dog a healthy raw diet while you travel. It may not be realistic to feed your dog raw while traveling. 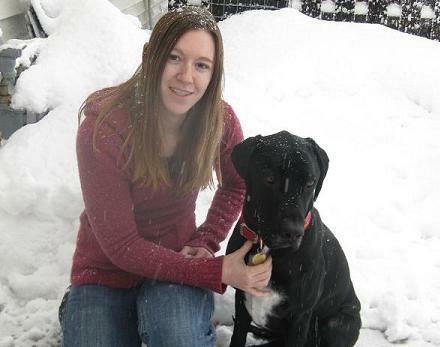 I know I plan to feed Ace kibble when we travel or when he stays at a kennel or with a pet sitter. If switching back and forth is too hard on his digestive system, then it may be better to stick to kibble 100 percent of the time. We will see. What pros or cons would you add to the list?